Built in 1878-9 by Cuncliffe and Dunlop in Port Glasgow, Scotland, the SS Hilda was a collier that ran on the short coastal run between the Newcastle and Illawarra coalfields (to the north and south of Sydney respectively) to the city. Displacing 222 tons and with a length of 125.2 feet and width of 21.2 feet, the Hilda was not a large ship by even collier standards. The ship had two masts with fore and aft sails to assist the steam engine. The ship was owned by Alexander Stuart who started and owned the Coalcliff Mining Company. Mr Stuart later became Sir Alexander Stuart and from 1883 to 1885 he was Premier of New South Wales. He also owned a number of other colliers. The Hilda left Glasgow on 8 March 1879 skippered by Captain F. Granger and arrived in Sydney Harbour on 24 May 1879. This was a pretty quick trip of 78 days (compare that to the 124 days the SS Woniora took in 1863). The ship was skippered in 1880 and 1886 by Captain Henry Wyatt who was a long-time employee of E. Vickery and Sons Ltd which owned the Coal Cliff coal mine in the Illawarra. The official records show that in 1886 ownership changed from Alexander Stuart to H. Robinson. Sir Alex died in 1886 so it was presumably sold at that time. In reality, the ship was still owned by Coalcliff Mining Company. This company was now owned by Sir John Robertson (also a Premier of NSW) and Charles Cowper. In 1892 the mine and ships were sold to Ebenzer Vickery and then on sold to E. Vickery and Sons. Unlike most of the ships that sunk off Sydney, the Hilda was not to meet its end, not during a violent storm as might be expected, but when conditions were perfect. On a regular run from Port Kembla to Sydney the Hilda left port on the evening of Wednesday, 19 July 1893 carrying an experienced crew of 11. The seas for the trip were smooth and the weather fine. She was loaded with coal for the French ship SS Armand Behic which was to depart Sydney Harbour on the next evening. The mate, Joseph Braithwaite, was in charge for the first part of the short trip up the coast. At 12.15 am the next morning the Hilda's master, Captain Charles Phillipson took over. Captain Phillipson had been the skipper of the Hilda for 14 months. All went well until 1 am when the Hilda was off Cronulla Beach. For some unknown reason, Captain Phillipson departed the bridge to go below. While he was away, he left the helmsman, Able Seaman Peter Martin, in charge of the vessel. He said that he ordered a course of north east by north and to contact him if necessary. This decision was to be the master's fatal mistake. The Captain returned to the bridge 10 minutes later (some reports say 45 minutes) and, seeing the ship was almost ashore, immediately gave the order to reverse the engines. The Hilda suddenly crashed ashore on the rocks below the steep sandstone cliffs but under the reverse action of the engines it came off again almost straight away. The engineer, George Henderson, reported that the vessel would sink within five minutes. Captain Phillipson ordered the crew to abandon ship. Two minutes later the SS Hilda was at the bottom of the Tasman Sea and the Captain and crew in the lifeboat. They rowed to Botany Bay and then walked to Sydney. Later that month a Marine Board of Inquiry met in Sydney to consider the wrecking of the SS Hilda. In short, the Board decided that the course laid down by the Captain was the correct one but his offence was having left the bridge with no-one in charge (Able Seaman Martin stated that he was steering north east by west). Accordingly, the official finding of the Board on 31 July 1893 was that the sinking of the SS Hilda was caused through the wrongful act or default of the master, for carelessly navigating the said ship and not taking sufficient precaution to see that she was properly steered. The Board suspended his certificate as master for three months. It was never revealed why the Captain left the bridge, but an assumption could be that he went below to go to the toilet, or even perhaps, for a drink. Located less than two hundred metres off Cape Baily Lighthouse on the Kurnell Peninsula on the southern outskirts of the city, the wreck of the SS Hilda is in reasonably good condition considering its relatively shallow depth, the extremely rough seas that pound this stretch of coast and its age. For a lot of wreck divers in Sydney, the wreck of the Hilda is considered to be not interesting enough (or more truthfully, probably deep enough) for them to dive. 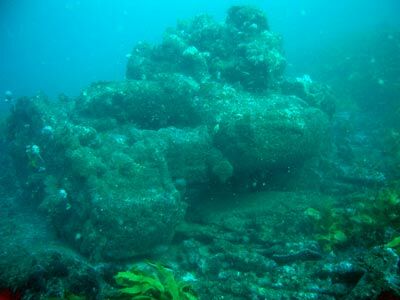 While there are wrecks that are far more intact, its shallow depth makes it accessible to virtually all divers and there is still a lot to see. 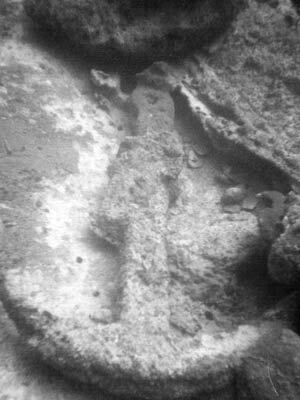 The remains of the SS Hilda now rest between 21 and 27 metres deep on a rocky bottom, with the majority in the 24 to 27 range. GPS Readings of 34° 02' 23"S 151° 13' 25"E (note that this is using AUS66 as datum - see my GPS Page for details) will put you near the wreck and by running in so that the southern side of the lighthouse is just showing and the northern side of the wall is invisible to you. 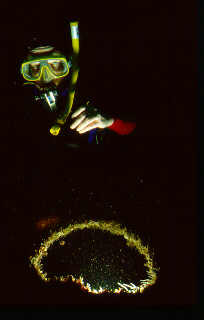 The depth will come up from 27 metres to about 20 metres. Drop anchor here. See the marks at left for the best way to find the site. It is reported that in 1958 the Hilda was blown up with a full case of dynamite by Sydney diver Barry May who was after the "valuable" metal of the vessel. Unfortunately, he further damaged the ship for no real gain as the prop was of iron construction and therefore of no value. Today the prop, minus one and a half of its four blades, lies in one piece with a bit of the prop shaft and rudder. Nearby, the rest of the rudder is lying on the sea-floor. Although well broken up, the remains of the Hilda are still roughly lie in the shape of a ship, albeit in two separate places. The engine is situated on a flat rock area at about 21 to 23 metres deep immediately above the prop. 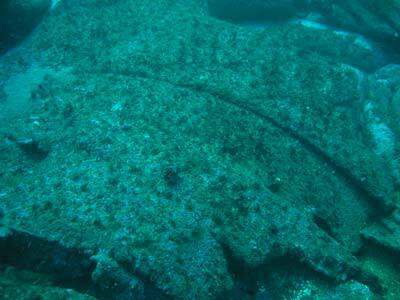 It is still in very good condition and is accompanied by a section of the hull. The engine and attached section of hull is canted over to its starboard side, lying almost totally on its side. This section faces north. There is a large winch located about ten metres to the north of the engine. Again, there is a section of hull bottom under this winch. 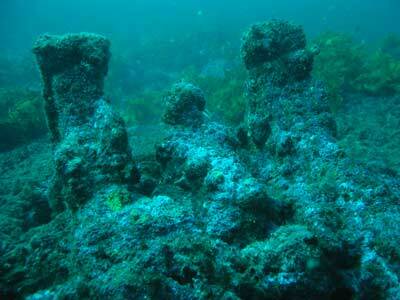 This would seem to indicate that the ship when it first hit the bottom was located at this location, facing north. Then, as the ship deteriorated, the lighter upper sections of the ship separated from the heavier hull bottom and was moved in a huge storm about 45° to the right (facing north-east), pivoting almost on the prop. 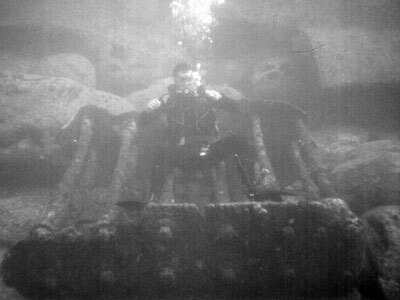 This part of the ship then dropped into deeper water, with the prop located only 10 metres from where it originally was situated. The upper section then over the years fell apart, dropping its bits in the shape of a ship. 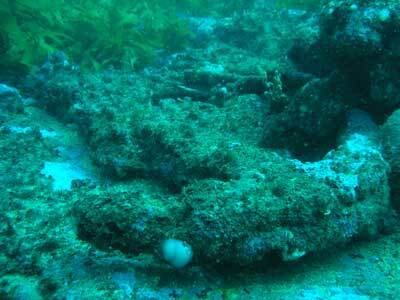 As mentioned, just below a low wall, the main wreckage of the Hilda runs in an south-west to north-east direction. The diagram by Tom Byron in his book Scuba Divers Guide - Southern NSW Coast, is fairly accurate in locating the main parts of the wreck, although it is not as accurate in locating some bits. The prop and rudder are the first sections encountered as you drop from the engine area and then other substantial parts such as boiler casings and boiler pipes. Some of this was damaged in mid or early 1997 by big seas and more damage in late July 2001 by even bigger seas. 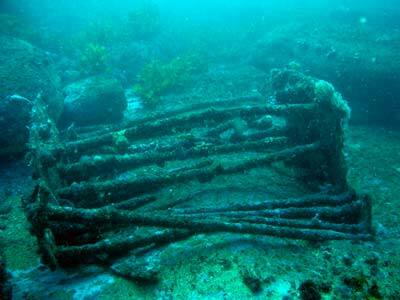 Further along you encounter the anchors (at least two) and chain, capstans, winches, davits, hull, plates, etc. It is an interesting thing to find the chain and follow it over the wreck to the anchor (it is not actually attached now) and to the ship's port anchor pipe. A dive on the Hilda can be extremely worthwhile and with a dive computer you can spend at least 25 to 28 minutes examining the wreck without the need to go into decompression diving. If you are a photographer, you can get some good shots of the prop and rudder and the large engine makes an impressive backdrop. All in all, the SS Hilda is a very good and interesting wreck dive for the occasional dive, say once every 18 to 24 months. I do not know who has the bell of the ship, but the whistle is in the possession of a friend who found it in 2001.